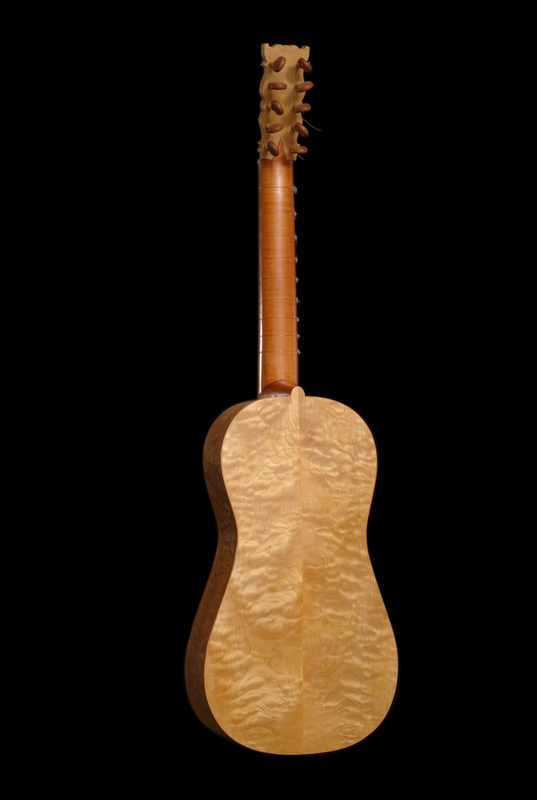 My passion for the luthier's craft was born after many years studying classical guitar. I consider the opportunity for having frequented José Romanillos and having profitted from his teachings to be among my most important professional experiences. 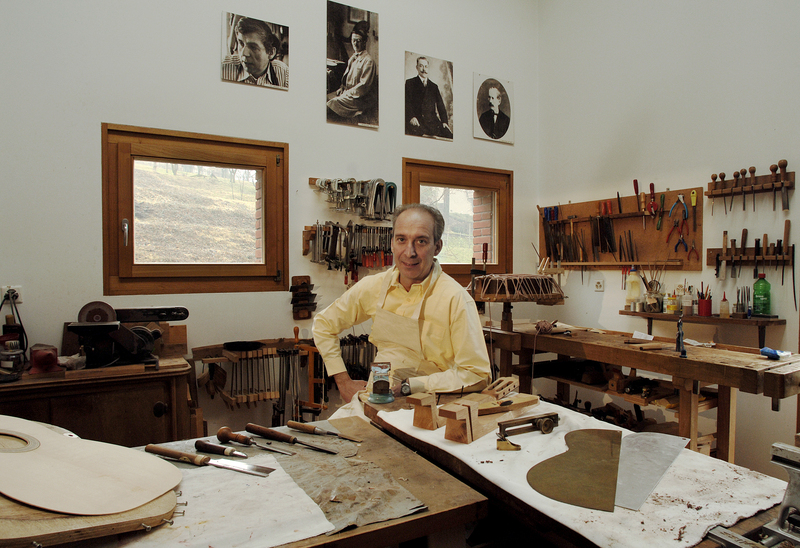 This experience of being near one of the greatest and most able guitar makers has undoubtedly transmitted inestimabile knowledge to me and suggested valuable solutions in the construction of guitars of the highest quality. So I learnt to “feel” wood, an always living and pulsating material to appreciate the simplicity of a project and the essential basics in the construction as a condition for obtaining an instrument with strong expressive attributes. I build guitars ranging from concert classic to flamenco. 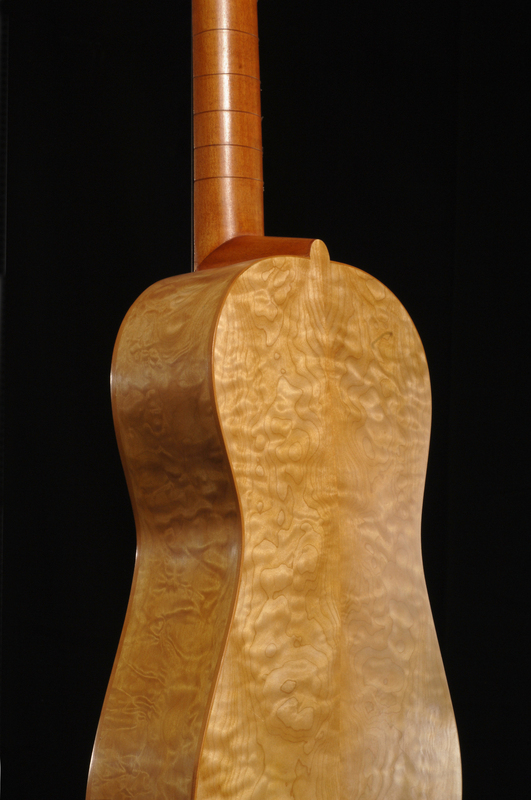 I use spruce for the harmonic tables, rosewoods (Indian, Rio, Madagascar) and cypress for the sides and the backs. 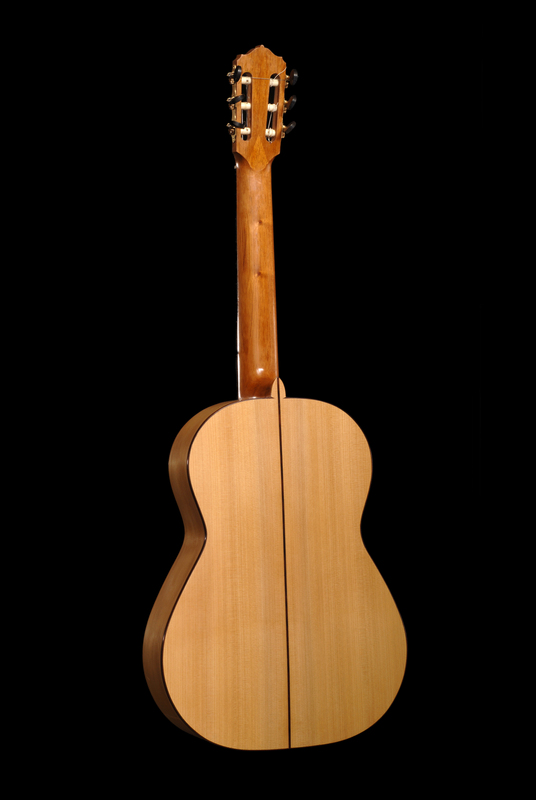 My guitars, following authentic Spanish tradition, are constructed without compromises, completely by hand in every detail, technical or decorative, like the sober decorations and inlays that are the result of the juxtaposition of natural woods. 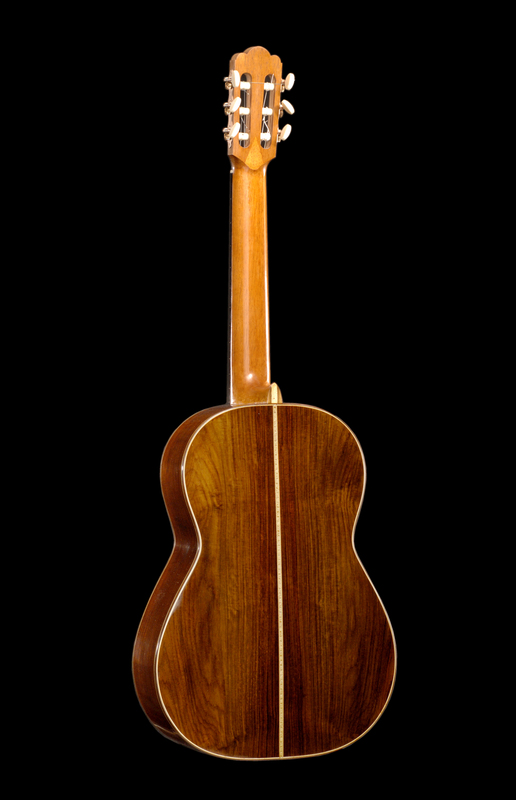 The few guitars that I manage to produce annually are addressed to demanding and sensitive lovers of music and of an ''instrument'' that becomes a protagonist. 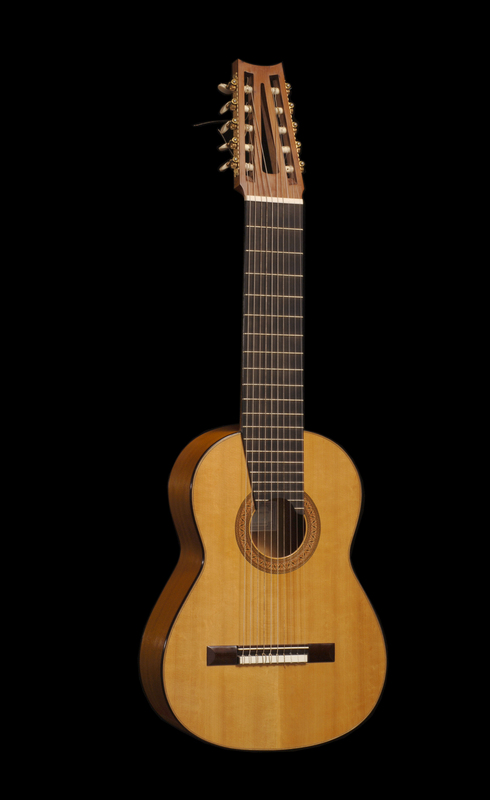 The Spanish classical guitar finds its counterpart in the flamenco guitar. One who loves the first cannot be disinterested in the latter: if not the same instrument, they are at least two sides of the same coin. I construct with great passion also flamenco guitars which have earned very flattering comments from professionals in the field. 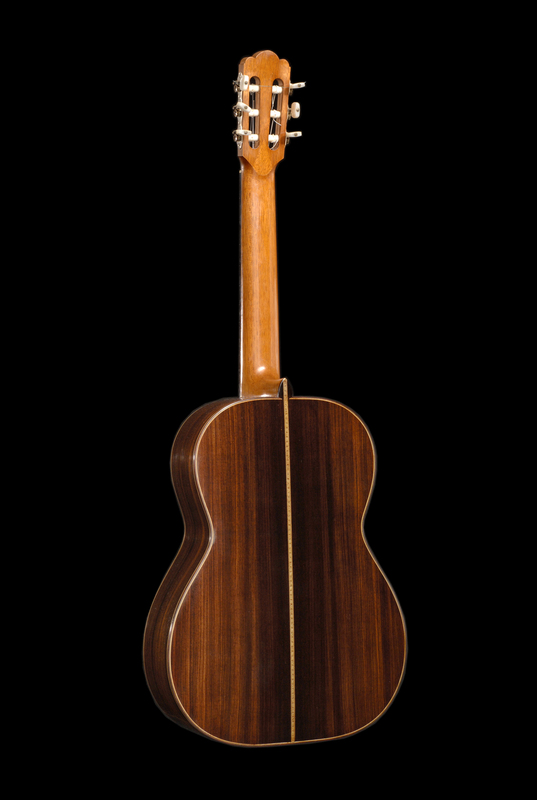 For those who, to fully express their musical ideas, feel the need to extend the range of their guitar, I also produce 7, 8 and 10 stringed instruments. In particular, my 10 stringed guitar project aims to keep the instrument as light and balanced as possible. 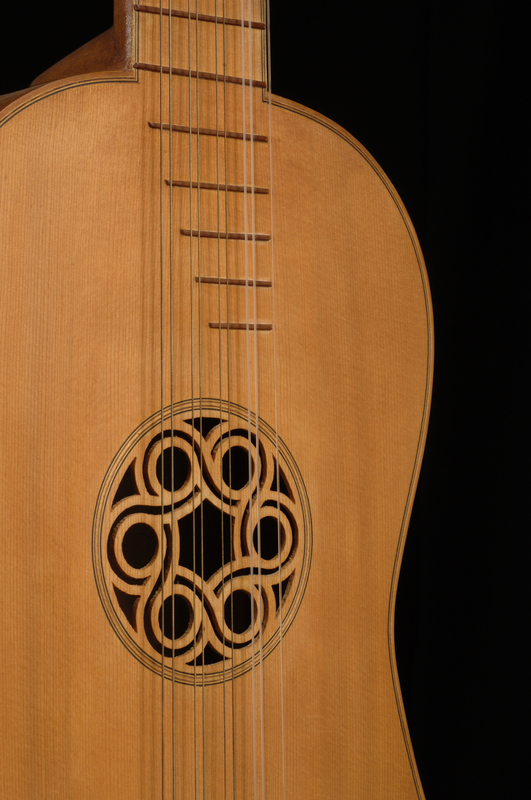 The 10 strings are not equally spaced, but slightly off-set as with baroque lutes and theorbos. 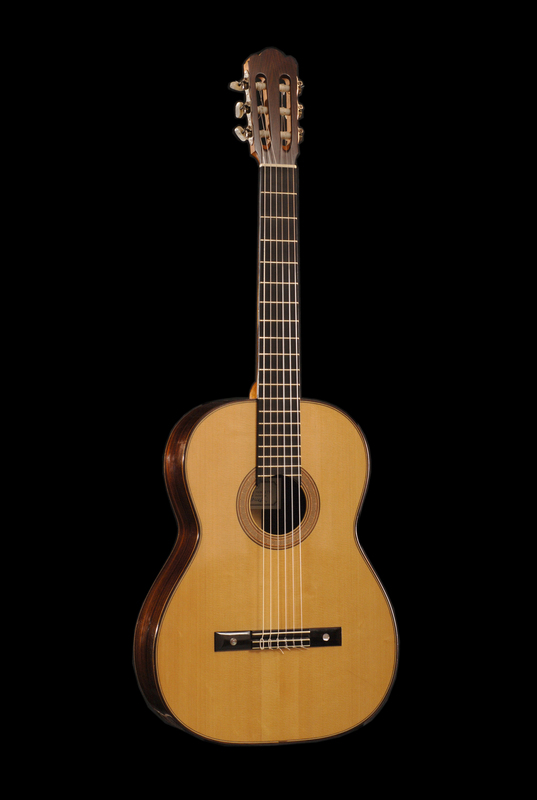 The 4 additional strings can be tuned either diatonically, or as on the guitar used by Narciso Yepes. 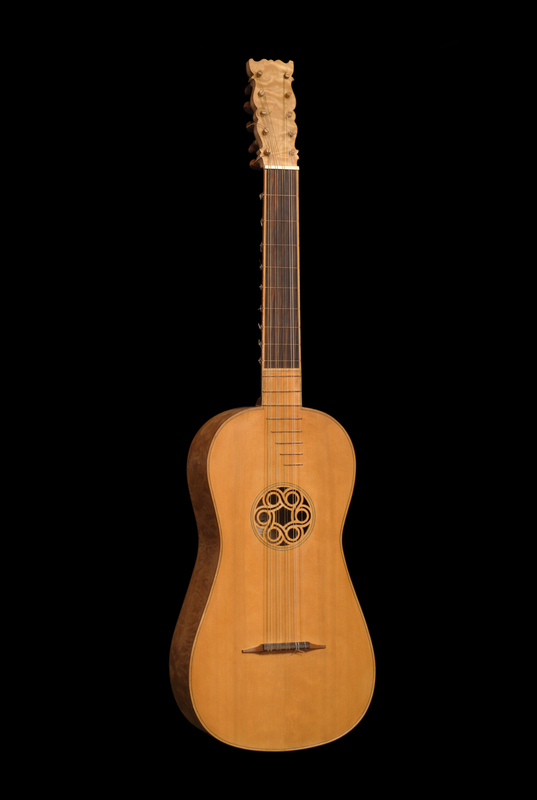 The instrument displayed here was been made early in my career as a guitar maker and it was inspired by a guitar built by the great Antonio Stradivari around 1680. 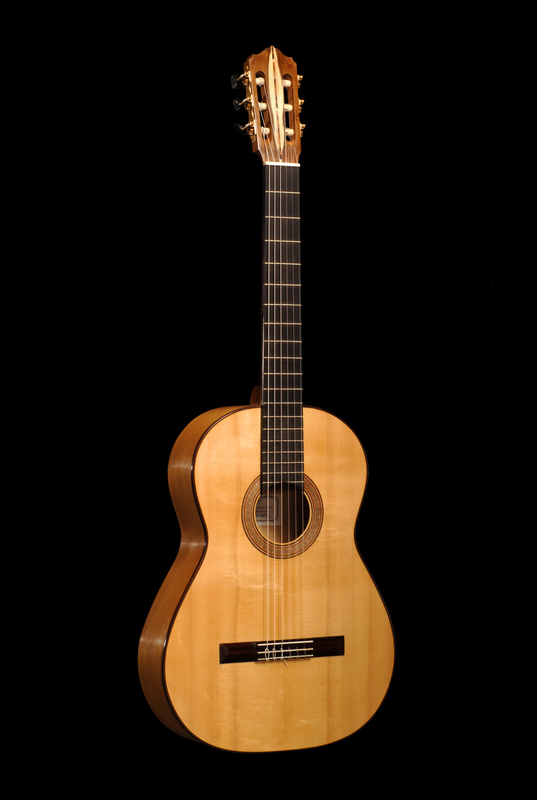 The baroque guitar was played from the XVI to the XVII century in Italy, France and Spain. It's design is based on chamber music. It is an instrument of intimate character. 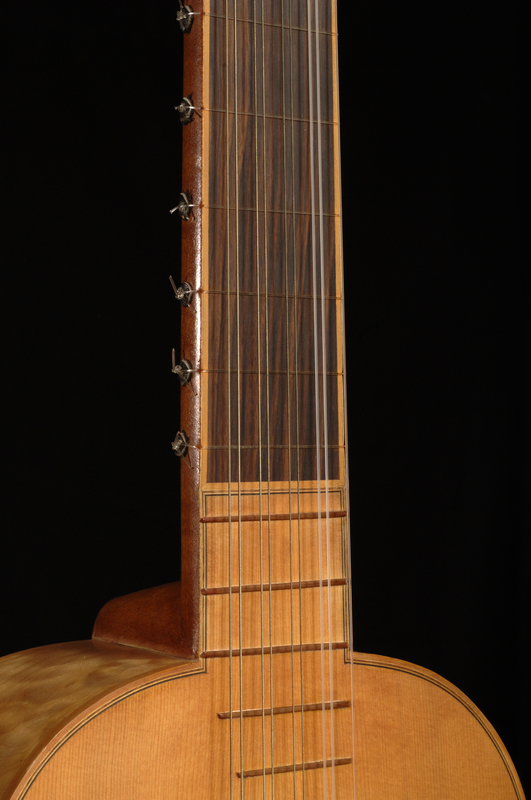 It was used frequently to accompany the human voice but was also played with other instruments. Notable also the compositions for solo guitar that were left for us by composers such as: Lodovico Roncalli ( 1654-1713). Robert DeVisée (1658-1725) and Gaspar Sanz (1640 1710). The influence of the long Arab presence in Spain can be perceived in the decoration that the luthier applies, even nowadays, with inlays placed especially around the soundhole. These are generally geometric patterns that constitute the builder's "signature". I execute them myself following original drawings, using veneers of various thicknesses with exclusively natural coloration. 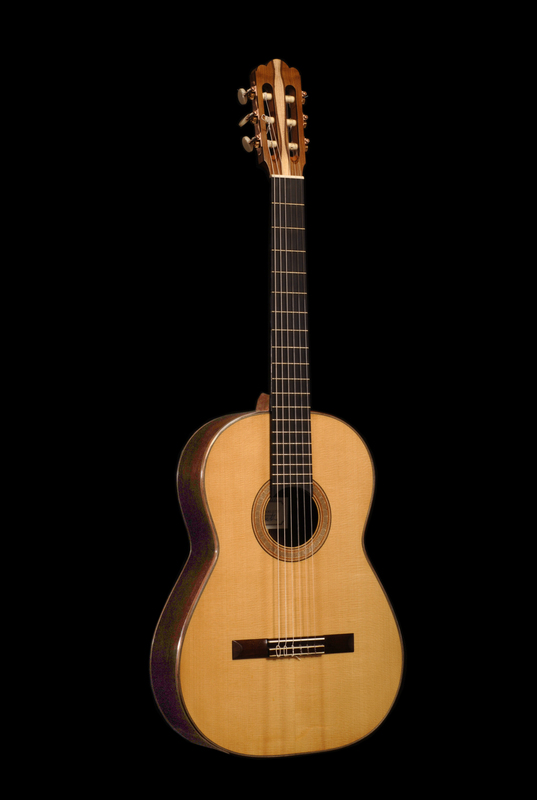 The quality of the materials is of capital importance in the construction of musical instruments. Even the best construction project, carried out by able and expert hands, will not give life to an exceptional instrument if one does not use materials of the first order. The cutting and storing of the planks must follow very precise criteria. The spruce that I use for the tables has been personally acquired in Switzerland in 1985 and ’86 and has thus reached optimum seasoning. What we have is a material of extraordinary elasticity and timbre. For the sides and ends I have in stock various types of rosewood from Brazil, India and Madagascar, besides maple, cypress and cherry. Apart from making guitars, I have been restoring them since many years. This activity has given me the opportunity of examining many precious instruments made by the great luthiers of the past thus gaining valuable knowledge.